This painting is a bonus. Every year I buy several hanging baskets in the spring, like most of us do, of course. The petunias last until about the middle of August and then just seem to fade. I put this pot of petunias at the back of the garden (I hate throwing away any sort of plant). 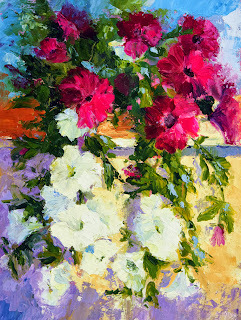 Early this week I saw that it had sprung back to life and the petunias were so nice and bright. I placed them on a ledge to admire them and then a shaft of sunlight hit them lighting them up nicely. Of course I had to paint them - hence the title.